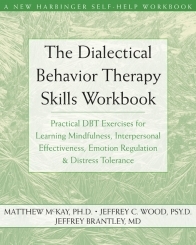 [by: Matthew McKay PhD, Jeffrey Wood PsyD, Jeffrey Brantley MD; New Harbinger Publications – 2007] A Clear and Effective Approach to Learning DBT Skills. First developed for treating borderline personality disorder, dialectical behavior therapy (DBT) has proven effective as a treatment for a range of other mental health problems, especially for those characterized by overwhelming emotions. Research shows that DBT can improve your ability to handle distress without losing control and acting destructively. In order to make use of these techniques, you need to build skills in four key areas-distress tolerance, mindfulness, emotion regulation, and interpersonal effectiveness.